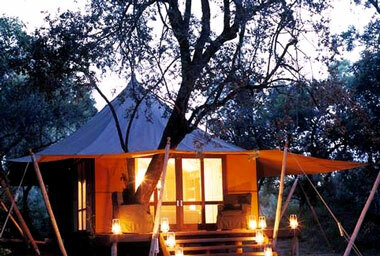 Ngala Tented Camp, Timbavati Private Game Reserve, a luxury under canvas wildlife accommodation venue on the western boundary of the Kruger National Park, South Africa. 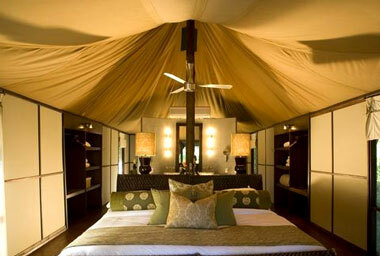 Ngala Tented Camp - accommodation bookings below - is the true wildlife safari experience, the canvas accommodation allows one to hear the night sounds - lion roaring is certainly something really special - what a memory! 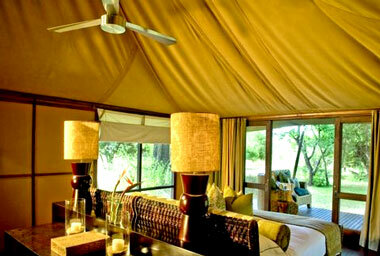 Safely cosseted in your modern tented suite. 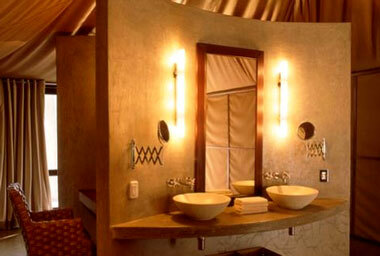 Accommodation in six spacious Safari tents set on wooden decks, each with private bathrooms en suite. 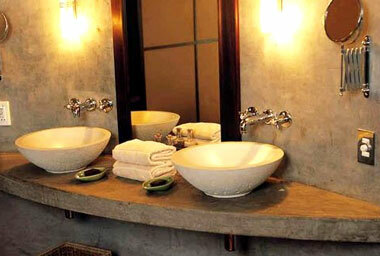 Separat toilet and also an outdoor private shower. Mounted on raised platforms, screened windows allow a breeze into your tent, supplemented by overhead fans. 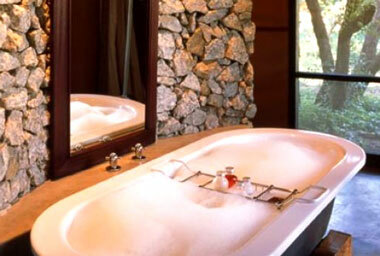 Stone and wooden partitions create cosy niches in the spacious suite. 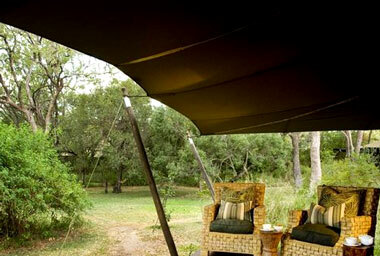 Built in the riparian vegetation on the banks of the Timbavati River, each tent has expansive views of game coming to drink. The main lodge area has decks overlooking the water-hole and river bed. A rim flow lap pool to cool off in in summer, fires during the winter to warm you. 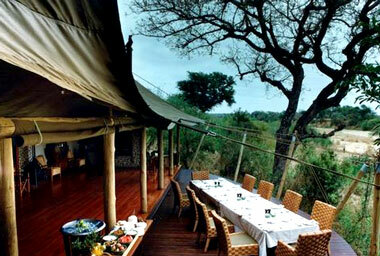 Ngala Safari Lodge includes all meals and the guided game activities in the tariff. 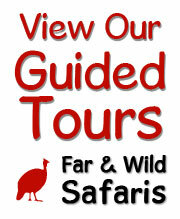 Guided game drives in open Safari vehicles are conducted early mornings and again afternoons into the evening. On the morning game drive the ranger will stop for tea / coffee and snacks on the afternoon evening game drive will stop for sundowners. On request guided walks with a ranger are offered, these normally immediately after returning from the morning game drive and breakfast. 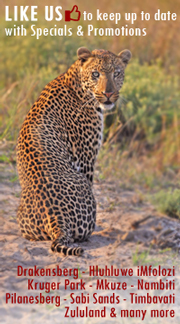 Ngala, the Shangaan word for lion - Ngala Game Reserve certainly lives up to its name and has a number of lion, leopard, another of the large cats are frequently seen. Ngala was the first private game reserve to be incorporated into the Kruger Park and is now part of one of South Africa's most innovative conservation initiatives. Ngala has exclusive traversing rights over almost 15 000 hectares of the Timbavati Game Reserve, one of the most bio-diverse areas in South Africa. 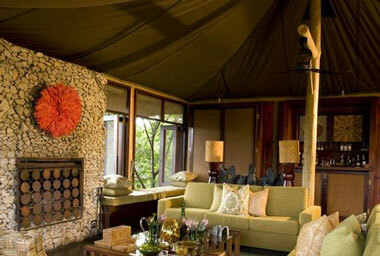 The Ngala Game Reserve has two venues offering luxury accommodation : Ngala Safari Lodge and also the Ngala Tented Camp. This camp was refurbished in early 2012. The Timbavati River, which flows only seasonally in the Ngala Game Reserve and generally only after the summer rains, supports a rich diversity of species. 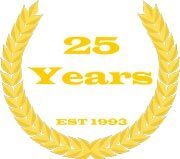 Underground water, present all year and usually only about a meter below the river's sandy surface. Elephant will dig to access this water in the river bed leaving these holes open and available for other animals to also come and drink. The Timbavati River and riparian forest support a large variety of animals. 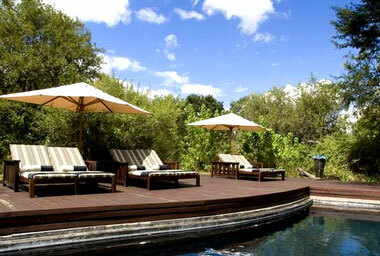 The reed beds are ideal for buffalo, leopard and elephant and a favorite haunt of bushbuck. The Ngala Game Reserve is a really excellent game park with the Big Five regularly seen along with giraffe, zebra, warthog and a variety of antelope.